This past November and December we had the opportunity to work with a talented and amicable group of adult employees from the Parque Biblioteca (public library park) in San Javier, Medellín, Colombia. This neighborhood sprawls along the hillside in Comuna 13, in the western-central part of the city. The slope of this area is so steep, in fact, that the district is served by a public cable car system! 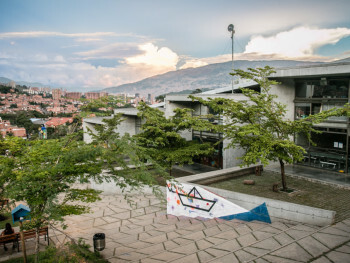 But sharp slopes, unfortunately, aren’t its only challenges, as San Javier also has had the reputation of being among the poorest and most dangerous neighborhoods in Medellín. 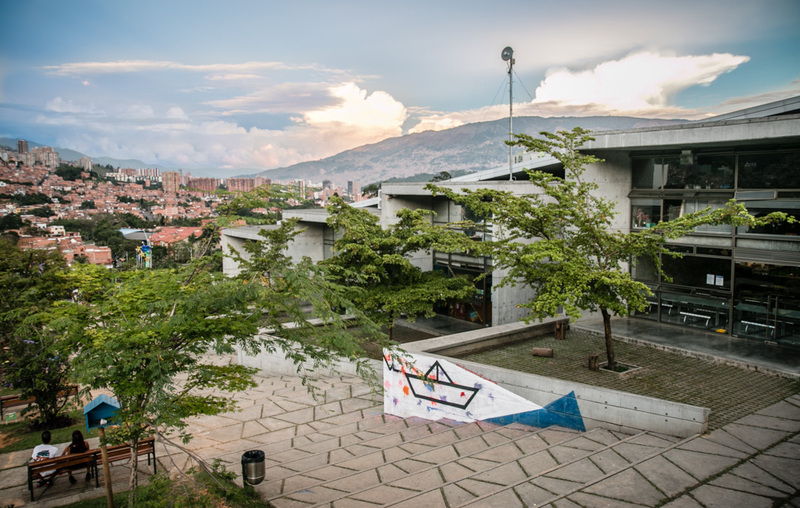 Fortunately, Medellín’s system of library parks, stunning architectural complexes that combine library buildings with ample green space around them, were created to address the need for more cultural and education space and public services in such less affluent neighborhoods. And the cohort of workshop participants that we worked with at the Parque Biblioteca San Javier are the very individuals charged with developing and providing these crucial programs. While we typically have worked with youth in our courses, more and more we have also been facilitating workshops with adult populations… and we absolutely love it! Overall, the degree of creativity and discipline shown by our older students has been highly impressive, giving the younger folks a real “run for their money”. And truly the technologies that our curriculum is based around, like the public libraries themselves, are for everyone, and should be shared as such. And finally I’d like to offer our great gratitude to Nathalia Miranda Ortiz, from the Alcaldia de Medellín, and Eliana Maldonado, Director of the Parque Biblioteca San Javier, for believing in Bent Marble and giving us the space, students, and support to realize all this great work. We really rely whole-heartedly on our organizational partners, and sincerely hope to return and expand upon the programs we offer in the library parks and in this great city, as our experience here has truly breathed new life into Bent Marble. ¡Viva la biblioteca! ¡Viva Medellín! Let’s keep this marble rolling! Steve Clack is a documentary filmmaker, digital storyteller, and educator from Elmira, New York, USA. He is the Founder and Executive Director of Bent Marble. © 2017 BentMarble. All Rights Reserved.